Happy 100th post! Just wanted to take a moment to thank all of my readers who have been with me since I started - and those who have joined in along the way. Exciting things are starting to happen. I had my first press writeup this week on Huffington Post - check out the article here. I selected the $44 Chapman Cone Bib which is now out of stock. It cost me just $5.80 out of pocket! Thanks Bauble Bar! I paired it with my $20 BCBG faux-fur vest and Rag and Bone sweater ($15, refurb) - both from the Rack. Picture is unfiltered and I'm sans makeup. I have to confess that I like to let my skin breathe most days and rarely wear makeup. When I got hit with adult acne in my 20s I spackled on a face daily for a good 2-3 years. After trying everything under the sun, I discovered Murad which cleared up my skin and saved my complexion. I've been using it ever since because I'm afraid to stop LOL. 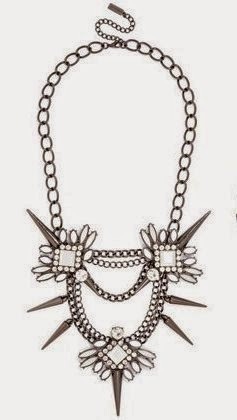 Then a couple days later I found Bauble Bar's Spiked Lily Necklace at Nordstrom Rack for $14.97. I had a Rack scratch off coupon for $10 off $75 so I grabbed a cute $60 dress and essentially got this $44 necklace for under $5! Score! Here I paired it my necklace with my Altuzarra for Target dress that I scored for 70% off ($12) and my Andrew Marc $50 leather moto jacket (Nordstrom Rack). I'm proud to say that when I got this jacket last year at the end of season it didn't fit and now it does :) I'm also wearing my stud earrings from the Rack ($5) and my new Sephora Rouge Shine Lipstick in Secret Affair. It's such a pretty, sheer pink/red but it has a weird smell. 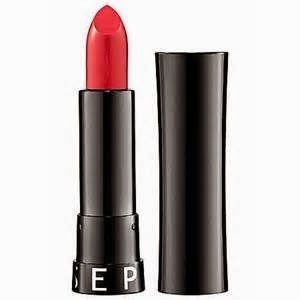 Once you start wearing $20-30 lipsticks it's hard to go back because there really are subtle difference - like smell and formula. Last week when I was at Burlington returning a couple dresses and having a sensor removed I peeked at their jewelry section. Most of it is pretty junky but I did notice a few Bauble Bar dupes for a fraction of the price. In this pic I'm wearing my $24 H&M coat that I pushed down so you could see the neckline on my Altuzarra for Target dress (70% off, $12) and I also have a few Yosca bracelets stacked (past sample sales, all less than $10 each). Here are a few more pics of pieces that are worth a mention - all for $6-$20 each. Some of them are available online with free shipping! 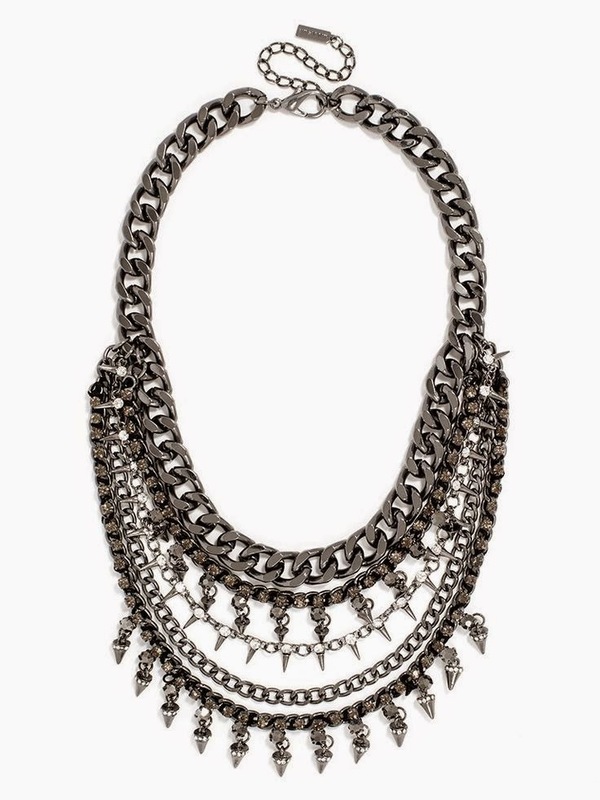 Chain link Drop Bib necklace (pictured above on the right), $14.99 available online here. 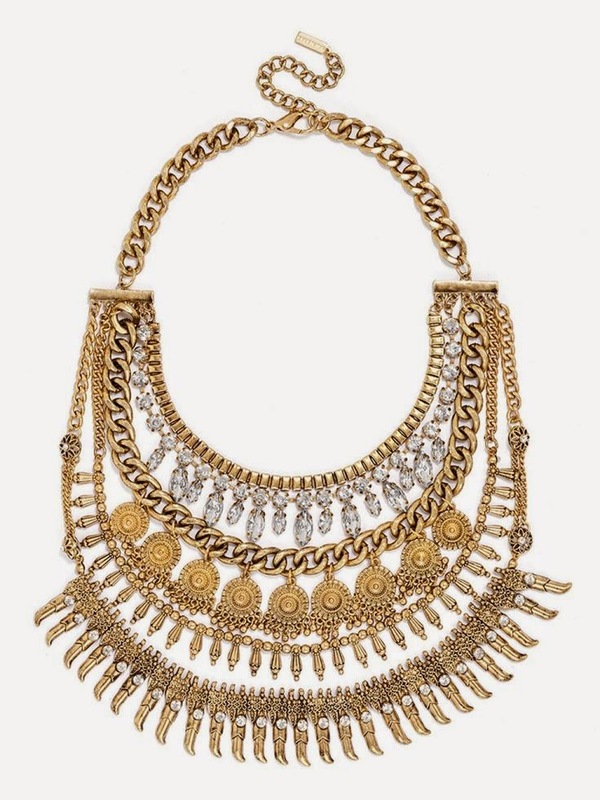 Layered bib necklace, $19.99 - available online here. I do have to say that the quality isn't as good - several pieces were broken, the chains were flimsier and a couple stones were missing here and there but the price was right. 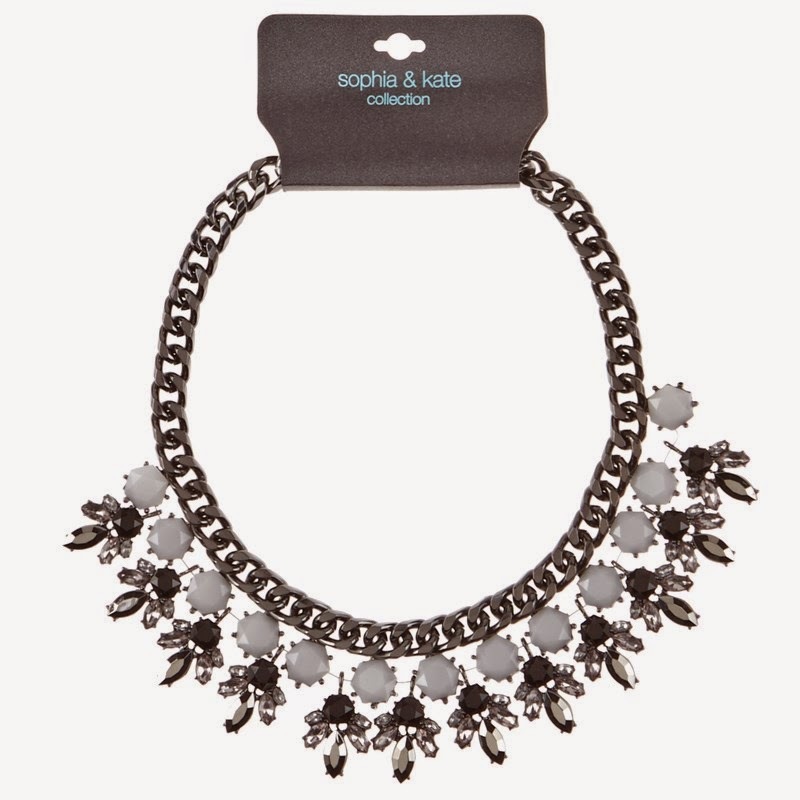 I resisted buying anything and it was a good thing I did because I'm pretty happy with my Bauble Bar pieces. When I noticed Tracy's Notebook of Style's Instagram pic alerting me to H&M's sale I was all over it LOL. I ran in the next day, but unfortunately I had fit issues with EVERY SINGLE PIECE that I tried on. It's funny, when I was younger I used to have issues with H&M but over the last couple years I've been pretty successful. I think now that I'm getting smaller I'm starting to get particular about fit again. Or maybe they cut this past collection badly. Anyone else have problems with H&M of late? I had high hopes when I was greeted by this selection. This print on this $25 skirt looks so 90s Prada - I wanted to love it but the skirt was just too full in the hip and not so flattering on me. My favorite ruffle sleeve dress went down to $10! I just don't need another so I left it. I love this $34.95 Dolce & Gabanna wanna-be, especially in this shade of orange. Too bad they cut too narrow in the hips and too large on top. It even came in black! Argh! Why can't it fit? When I went into the City for a couple sample sales this week I popped into the H&M Flagship on 5th. They always have the most amazing displays. This time I was greeted by a sea of blondes and beautiful sweaters. They also had Tony Bennet and Lady Gaga on a large screen playing over and over. Seriously, what's not to love? They actually had even less of a sale selection than my local store but it's still always fun to look there. My first stop that day was the Gerard Yosca sample sale. I've been hitting that sale for 15+ years - I even got my wedding jewelry there. They do product development for other companies too, like Banana Republic, so I picked up a couple BR pieces as well. But it's the Yosca pieces that are really special. I always select the past season items which are sold for 70-90% off. I try to pick up a couple extras for gifts for the year but I always take a couple special Yosca pieces for myself. The most expensive piece I selected was the cuff for $25 (I LOVE his cuffs and similar pieces retail for $200+) and the earrings in the center for $20. I almost didn't get the earrings because one of the Swarovski crystals were missing and they told me they couldn't replace it. 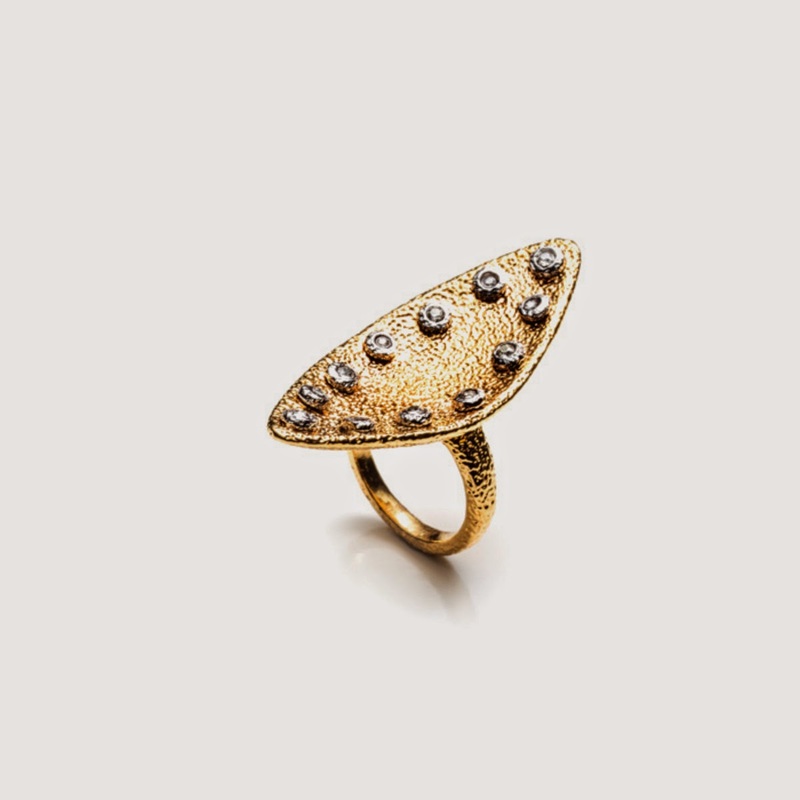 Then later when the designer was visiting the sale (he always pops in to say hello) he noticed me considering them so I made sure the mention the missing stone and Voila - he put another one in. Over the years I've learned it's all who you ask :) Thanks Gerard! In case you're wondering, the Banana pieces are the turquoise necklace ($8), gold hammered earrings ($5) and the silver tassel earrings ($5). The long chain necklace ($8), chain bracelets ($5), and bangle ($5) are all Yosca (in addition to the cuff and Swarovski drop earrings). Afterwards, I made out like a bandit at the AV Max sample sale. I love their gold hammered cuff that I purchased at the Rent the Runway sample sale for $17 + tax. Here I scored 8 cuffs for $55 ($5-10 each, no tax). I might not have needed all of them but it's hard for me to leave a $5 cuff because I love cuffs so much! And last but not least is the ongoing saga of Alexis Bittar. 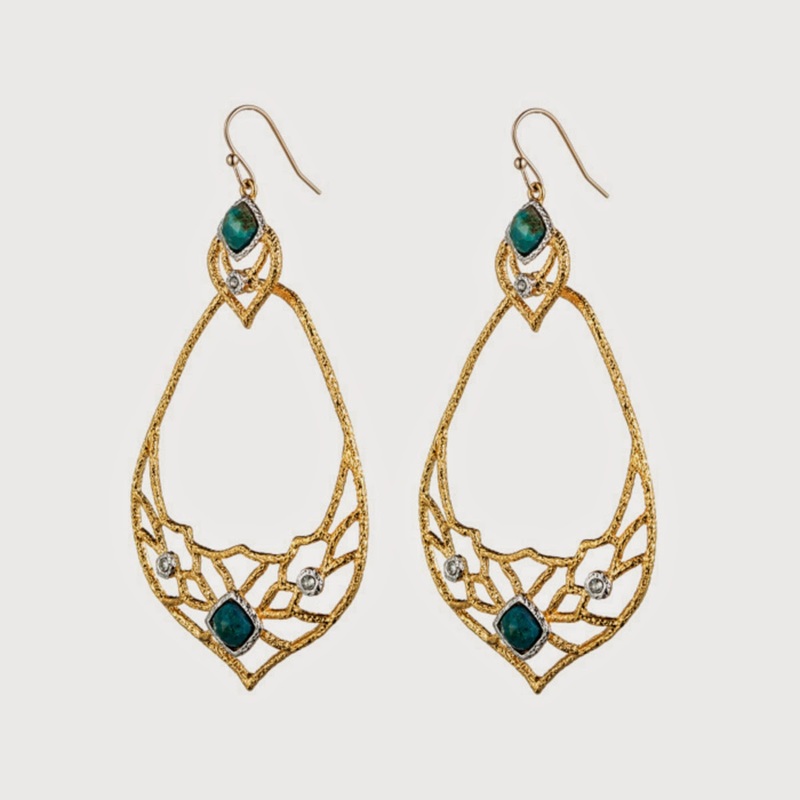 A few days after placing my order I noticed a pair of earrings was missing from my shipping confirmation. This is problematic because I used the Gilt City voucher and then $50 of my credit would be lost (as the small-print read that it was for one time use, no credits). My husband told me not to worry, perhaps they would be shipping it separately. I still called and emailed and didn't hear back. Well they didn't ship it AND when I got my order they sent me the wrong bracelet which was cheaper, and not my taste. The SKU numbers were pretty similar and the style wasn't so far off so I can see how whoever packed the order got confused. 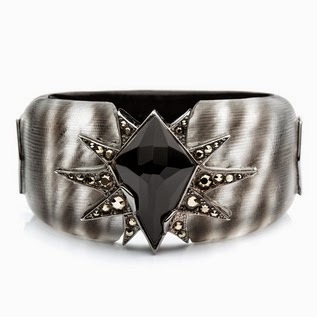 And this is the bracelet I ordered but didn't get. They sent a narrower bangle version without the print which was kinda blah. Two of my correct items arrived - I like oversized earrings and these are pretty light. They only had a size 7 of this ring so I took it anyway - it's a little big on my center finger but it's still cute. The gold is also yellower than pictured which I don't love but I don't hate either. So yeah, after my order came I called and emailed some more and nada. Finally I called one of the NYC stores and explained my situation and the sales associate assured me they would pass along my information to the correct channels. Magically the next day I get an email from UPS that I was getting something from Alexis Bittar. After days of emailing, calling and even tweeting, my correct bracelet arrived with a return shipping label for the wrong one - but still no earrings. Mind you nobody even contacted me - they just sent me my bangle. Hello? 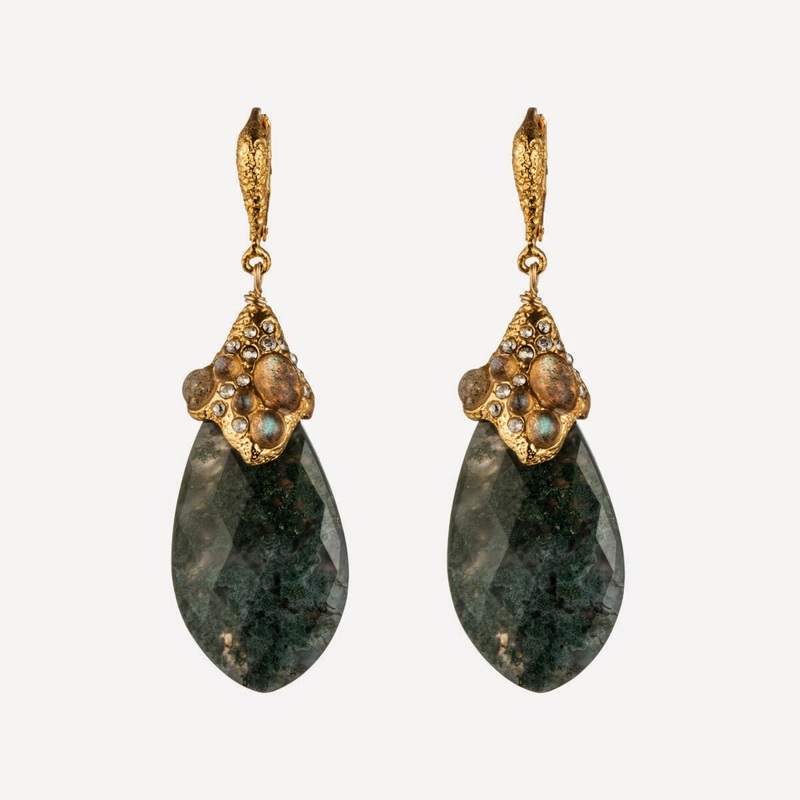 Where are my earrings Alexis Bittar? So while this was a step in the right direction we are not done here. If something was out of stock they should have contacted me so I can select another piece so I wouldn't loose my credit. Anything less is poor customer service or just plain stealing my money. I would like to apologize if any of you had problems as well - I feel really bad when I recommend a sale from what I thought was a reputable company and then they screw up so badly. I'm so disappointed that there has been zero communication, and no apologies. I'm have hope they will make good but if not, I'll be contacting both Gilt City and the Better Business Bureau. Again, I'm so sorry if you had any issues with your orders as well. Alexis Bittar...what a mess. I've been pretty busy and haven't had a chance to call. Good to know that getting in the NY store is a good way to do it. (Btw, not blaming you at all, just sharing in your frustration.) I'm especially annoyed because my order went slightly over the cost of the Gilt City groupon ($27) and they had the gall to charge me for it, even though they didn't deliver my ring. I got the same oversized earrings, a ring (not delivered), and a really awesome bracelet with talons that I love. Your Yosca sale haul is lovely. I went on your recommendation and picked up a few little pieces; they undercharged me, probably because I went late on the second day. Quick question: I was following you on instagram and now I can't! I'm guessing you might have thought my account was a ghost account (I haven't posted anything and don't have any followers) and blocked me? Mind adding me back? I'm sadpears on instagram (lol don't ask.) Thanks! If you prefer I can, I dunno, add a few photos. What did you think of Yosca? At this point it's a habit but I always find a few inexpensive pieces that I love. What did you end up getting? I realized that I looked like a ghost in retrospect, so I slapped up a few photos and am going to try to not look like a ghost haha! It's not that I don't want to post, I just feel kind of awkward cluttering up other people's feeds, which I know is weird because I LOVE seeing other people's finds, so maybe I just need to get over myself. I really liked Yosca! To be honest I wasn't sure before getting there, because I'm not really a jewelry person (speaking of which, your mod shots are stunning as always, you have flawless taste and are just beautiful.) I have a few "classic" pieces that I recycle (pearl necklace, diamond studs,, etc.) 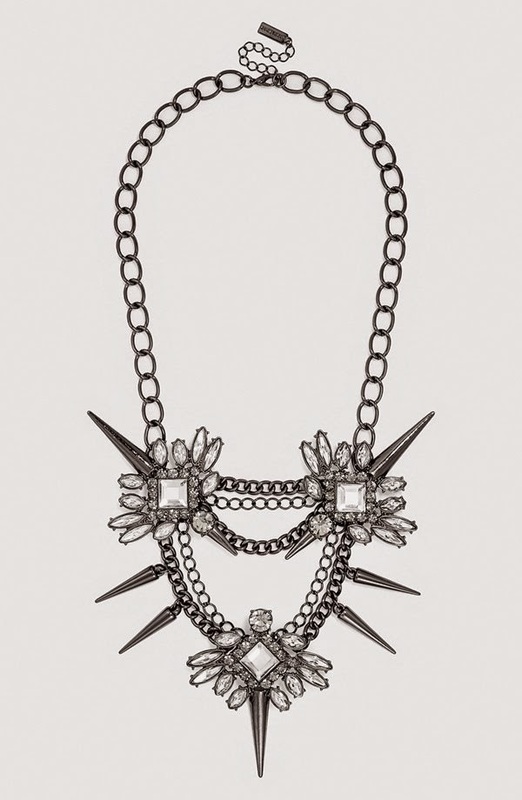 but seeing how you style your fun costume jewelry made me want to get some too. Just get over it and share your finds too - there is a whole community of penny finders, Rack girls and bargainistas who would love to see your deals! I just checked and Alexis Bittar charged me too!!!! They better fix this fast...so ridiculous!